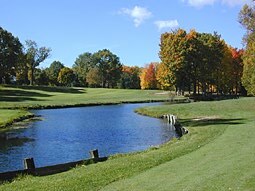 Golfers who regularly play the courses of the Traverse City area agree that the Interlochen Golf Club is one of the most scenic and lush course in the region. Laid out through a mature forest of large mixed hardwoods and white pines, Interlochen challenges the weekend golfer and lowhandicapper alike with strategically-placed bunkers and water hazards that make the course a club selector’s delight. Precision shotmaking and good course management are at a premium at Interlochen. A mature course, the velvet greens and lush fairways of Interlochen are immaculately groomed so that the challenge is always fair. Golfers are also treated to the natural abundance of Northern Michigan Wildlife. It is not uncommon to see white-tail deer, wild turkeys and a gathering of wild Canadian geese. A peaceful tributary of the Betsie River winds throughout the course adding its own watery touch of beauty and charm. The back-to-back 12th and 13th holes are the toughest on the course. The 12th Hole is a 530-yard par five with water located on the right side of the fairway and in front of the green. There’s also a heavy swamp area in the back of the green. The 13th Hole is the number-one handicap hole. It’s a 455-yard par four. It takes a 260-yard drive to set up a good approach shot to the green. It’s heavily wooded on the right side so a golfer must stay left to have a chance at par. Rated one of the top 100 best value courses in America! Leading Pro Line Golf Clubs with the at the lowest prices available.